Nissa's String Studio saw its beginnings in an apartment living room, moving through a few basements (we have a saying in our studio that if you remember the shaggy carpet walls on Tipperary Trail, you are VIP), a small office space in South 48th Street, and eventually landing at our current space. Last October marked our fifth anniversary at 3900 South Street, and even though this location has served us well, the studio's growth in the last year has made us seriously consider a move into a bigger, more suitable space that would give us the opportunity to accommodate the current higher demand. We are extremely excited to announce Nissa's String Studio's next milestone: a brand-new, built-to-suit studio with spacious lesson rooms, and a modern, comfortable waiting room. 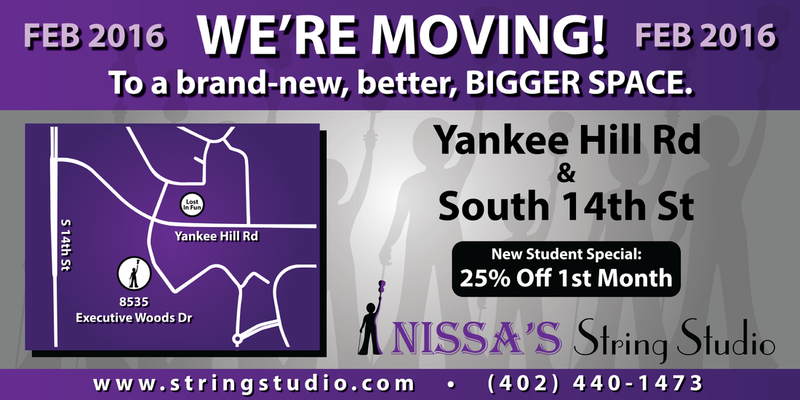 The move to the new studio, located at 8535 Executive Woods Drive (Yankee Hill Rd and S 14th St), will take place in February of 2016. Our new studio is in proximity to places such as Lost In Fun, Nebraska Cheer Center, Tiger Rock Academy, and Southwest High School. Our decision to move the studio to this area was primarily based on two factors: the majority of our students currently residing in South Lincoln, and the significant growth this part of town has experienced, and continues to experience, including a $100 million South Pointe expansion project to gradually take place during the next several years. -Five spacious, soundproof lesson rooms with great natural lighting (each room has several big windows). The addition of a fifth lesson room will give us greater scheduling flexibility. -Big, modern waiting area with comfortable furniture, daily color-changing wall lighting accents, beverages, snacks, a candy machine, and complimentary coffee, tea, hot cocoa, and water. -The waiting area will also serve as a space for Spitfire Fiddle Band practices, workshops, and music presentations. -Wireless Internet access and USB charging stations across the studio. -Two working stations with privacy walls, additional lighting, and AC/USB outlets. -"Kid's Corner" with children's coloring and activity books, toys, etc. -Men's and women's separate restrooms. -Easy access for our numerous out-of-town students. -Last but not least, Chester the Bear will be coming with us to the new studio. We are beyond thrilled to welcome everybody to our brand-new studio, and we are planning a big grand-opening event; we will announce a final date for the move and grand-opening event in the coming weeks. We will continue to provide project updates via our Facebook page, Twitter (@nissasstudio), Instagram (nissasstudio), and via email. Please let us know if you have any questions by calling us at (402) 440-1473 or sending us an email at info@stringstudio.com. We would like to thank each and every one of you for your continued support, and for trusting us with your and/or your children's musical education. We feel truly honored to be a part of this community.